Featuring a garden and free WiFi, Reliqua Galle is situated in Galle, 2.1 km from Galle Fort. Featuring a shared lounge, the hostel has air-conditioned rooms with a private bathroom, Guests will have access to the villa with its Shared sitting, dining, beautiful garden and lawn and a fully functional kitchen and a Restaurant with a Delicious Menu. Currently the hostel has a Room with 01 Double bed, a room with 02 Double Beds, a room with 02 Single Beds, 01 Rooms with 03 Bunk Beds and 01 Room with Single Bunk bed. 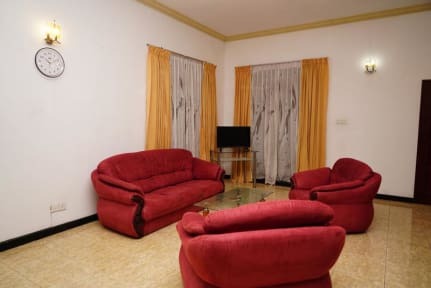 We offer the most comparative rates in Galle with a quality accommodation. 1. Cancellation policy: At least 7 days advance notice for free cancellation. You will be charged 50% of the total price if you cancel in the 7 days before arrival. If you don’t show up you will be charged the total price. 5. 11% taxes is not included in the room rate. 6. No Smoking inside Villa. Could smoke at Designated areas.